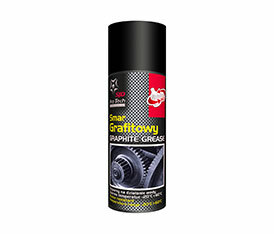 Graphite grease used to lubricate leaf springs, screw threads, open gears, chains and other heavily loaded friction surfaces, working in the temperature range from -20 to +60 C. It has a penetrating and preservative properties. The lubricant is water resistant. Shake well before use. Apply directly to the lubricated components.